We arrived in Haiti just in time for Haiti’s Independence Day on January 1st. This is Haiti’s biggest holiday and we celebrated with family and friends with lots of fried goat and plantains! Zacharie had not spent a new years in Haiti for a long time so he was really happy to be able to be here to celebrate! The evening we arrived I FINALLY got to meet Katheline (similar to Kathlene in English). For those who don’t know, she is the first orphan to join us at New Life Children’s Home. She is a beautiful, kind hearted, hard working, 8 year old girl and we are so in love with her already. God could not have blessed us more richly! She fits so perfectly into our family and we are excited to spend more time with her these next 2 months we’re here. I’m already dreading the thought of having to leave her, but she will be left in good hands with Zacharie’s family until we return. Less than a week after we arrived construction of the pavilion began! As always our work crew amazes me with their hard work and we should be laying the roof next week! The pavilion’s main function will be a cafeteria for the children that will provide a nice area to gather together as a family. The ceramic for the home is almost done and we are finishing up the plumbing! It makes my heart so happy to see these final details coming together in preparation to open the home to more children! View of our whole property – pavilion, depot storage/upstairs rooms, and children’s home! We have really enjoyed the past two weeks of teams that have joined us here! The first week we had 13 men and women help us with construction of the pavilion and other maintenance jobs around the property. We were blown away to see the initiative you took to get as much done as possible and we really appreciate all you did! This past week we had a group of 10 (only one guy – Peter you’re a trooper!) and we had such a fun time together. They began painting in the children’s home and did a beautiful job! It always amazes me to see how God can unite a group of strangers in just one week! Hated to say goodbye to them! Both weeks went so well and we are excited for another group to come today! They will focus on building beds, tables, benches for the children’s home. Both teams got to share a bible story and meal with the children in the community! The first team fed just over 160 kids and word must have gotten out the second week as we had over 200 children come! Every time it feels like Jesus feeding the five thousand as every last child found food – thank you Lord! This is one of my favorite ministries and I love to see the kids’ smiling & giggling faces when they walk out the gate! Both teams also had the opportunity to visit Mirbalais Prison. Juice, bread, and hygiene supplies were provided to each prisoner as well as the chance to pray with them. These men and women live in terrible conditions with not enough room in some cells for everyone to lay down at once. We pray that our visits offer hope and encouragement to change their lives for the better once they’re released. A couple of years ago Alive Church Ephrata’s childrens program raised money to purchase appliances for the children’s home. Two weeks ago we got to purchase a 6 burner stove, refridgerator, water dispensor, outdoor gas grill (to cook larger pots of rice, etc.) AND put remaining money towards a new generator! God is so good and we can’t say thank you enough to Alive for their time & efforts to fundraise for us! Sometimes I wish there was a handbook on how to be Haitian when you’re not or how to preach to a culture SO different from your own. Sometimes at the end of the day I think, ‘How in world will I ever be able to live here full time? !’ But then God shoves something in my face just like this. He WILL use you and He WILL guide you if you choose to follow the path he has laid before you. If you seek him you WILL find him. Even when it seems impossibly frustrating – like when you live in a dusty, dirty construction zone with a one year old or when there isn’t enough water to shower – God WILL lead you through it as he promises over and over in the bible. I pray I can learn to be wild in my relationship with Christ…to learn to love him and trust him unconditionally so that I can do as much as I can to serve Him and the people here in Haiti. And I pray the same for you. Trust Him and Be Bold in your relationship with God because no matter where you are you are in the mission field! Thank you to all who read our updates and send prayers. We feel them and are excited to see what else is in store for us while we are here. Please pray for good health for everyone. Poor Abe had 4 teeth break through at the same time and has not been the happiest guy so we’re hoping his mood improves at the teeth finish coming in! Katheline has had a fever off and on and we are praying that we can control it with Tylenol and that it isn’t Malaria! We have had mysteriously chilly weather in the evenings and mornings here but it’s now starting to get warmer with the mosquitoes getting worse so we are asking for prayers for protection over the whole family as well as for team members! Thank you again! We love you all! Bondye Benni Ou – God Bless You!! Yet again God has provided for New Life Children’s Home way beyond our wildest dreams! The second annual Hoedown for Haiti was on October 15, 2016. Tickets sold out just days before the event and we had a packed house of over 170 people! Our financial goal was $20,000. For those who attended last year you may remember we had a goal of $10,000 and brought in over $19,000 so we thought ‘Hey! Why don’t we double our goal!’ … So with this year’s goal was set and we had high hopes to have another successful fundraiser for the Children’s Home! Well, with only 3 weeks left before the event we were just barely at 50% of our goal had less than 100 tickets sold! Needless to say we (or really I should say I) were discouraged! But the week of the event phone calls flooded in for reservations and we sold out of tickets just days before! And with over 60 businesses/friends donating financial gifts and raffle prizes over $27,000 was brought in for New Life Children’s Home by the end of the event. I know I say it all the time but it’s well worth repeating! God is SO good people!! We want to give a special shout out to our business financial sponsors Paul B Zimmerman, Inc., Rocky Ridge Auto, MN Zimmerman Company, Kevin’s Property Services, Graham’s Auto Sales & Services, Zartman Erosion Control Products, Ulrich Construction, and Keller Brothers Ford Lititz!! Thank you for your contributions! We had an AWESOME meal including J.R.’s Brisket & BBQ chicken as well as Jill Zimmerman’s cupcakes and Delvin Huber’s ice cream for dessert! We want to say thank you to several kind local grocery stores for your gift cards that went toward our meal purchases! Sharp Shopper, Giant Grocery Ephrata, Shady Maple Farm Market, Yoder’s Country Market, Weavers Market, Ebenezer Groceries, & Weis Markets Ephrata we greatly appreciate your donation! We had a TON of raffle prizes to choose from this year as local businesses and friends were so generous! So thank you to Rebekah Viola Photography, Janae Rose Photography, Dialogue Photography, LuLa Roe with Jenna & Lauren, Lil’ Loves Designs, Bee Still Crochet, Scratch Bakes, Janet Luta Massage, Goods Store, Bombergers, Black & Black Dental, Creekside Dental Group, Sight & Sound, Attractions Hair Salon in Lititz, Mary Kay with Crystal Weaver, Thiry One with Annette Bishop, Federal Taphouse, Lancaster Brewing Company, Hursh’s Country Store, Mister Car Wash, DNA Weaponry, Asher’s Chocolates, Choice Fitness Denver, PA, The Coffee Station at Landis Valley, Brickerville House Restaurant, Royer’s Pharmacy, Heavenly Soaps and Scents, Reflections Restaurant, Esbenshade’s Greenhouses, Salon Art-Tiff, Muddy Creek Studio, Redner’s Markets, Stoner Decorating Center, Iron Pigs Lehigh Valley, Reading Fightin’ Phils, Martin’s Custom Butchering, Pellman Foods, Kerper’s Gun Shop, Julius Sturgis Pretzels, Aimee Weaver Designs! So along with support for Katelene the funds raised at the Hoedown will go towards continued construction of the Children’s Home as well as toward construction of a multipurpose pavilion (mainly to be used as a cafeteria) and beds, benches, tables for the kids. So THANK YOU, THANK YOU, THANK YOU for all the ways you all have helped us rather it be financially or through prayer! We give all the glory to God! Our family will be traveling down in December for 3 months to continue the work. We ask for prayers of strength, protection and that God’s work will be done in Haiti – not our own. And we also want to give one more shout out to our Hoedown Committee – Cindy Zimmerman, Gloria Chmiel, Trudi Keeport, Janice Horning, Jess Nolt, Mechelle Horning, Jill Zimmerman, Melissa Wagner, Delvin Huber… We could NOT have done this without your hard work! God is amazing. To think last year our vision to build this orphanage was just that. And now as you can see in the photo above, progress has been made. We have 2 storage rooms with 2 sleeping rooms and a bathroom above. The Children’s Home has 6 bedrooms with 3 bathrooms. The kitchen is behind the house. The security wall is being finished. Our next project is to build a pavilion where the children can eat and we can hold programs for them. Because of the hot climate, homes are built with outdoor living in mind. Our goal is to open our doors the end of 2017. Please continue to pray for us. We visited the prison in Mirbalias. There are 13 cells with almost 400 men and women. We were able to take them a treat of bread and juice. We prayed and shared the gospel. The warden told us 2 of the men that were released, found Jesus while in the prison. They returned to their communities and now began ministries within their own hometowns. It was encouraging to hear of some fruit from our labor. It is very humbling to witness the conditions there. Please pray for the inmates, that hearts will be changed. Currently we have 56 children participating in our child sponsorship program. This program provides the funding for a child to attend school. It pays for their tuition, books and uniforms. In Haiti, education is not sponsored by the government. For a child to go to school may cause a family great economic hardship. Children are unable to attend when families do not have the means to pay the fees. There are no laws governing that a child must go to school. So for many if you cannot afford schooling, your child simply does not go to school. We feel education is an important key in helping to eradicate poverty. We are happy to say that five of our students have graduated from high school this past year. We want to thank each and every one of you who donated backpacks, shoes and school supplies for the children that participate in our child sponsorship program. School began September 12th and everyone was prepared. You have blessed each and everyone of these children. This year, each child is sponsored. Photos were taken of the children and each child wrote their sponsor a letter. Of course most had to be interpreted. Look for them to come in snail mail to you soon. Click below for an update with more pictures! We are having the second annual Hoedown for Haiti in just 25 days on October 15, 2016! We are getting down to the final details of the home and we are almost finished! The funds raised at this event will go towards a multi purpose pavilion & beds, desks, clothes, supplies etc for the kids! OR you can purchase your tickets online HERE but please note there is a small processing fee when purchasing this way. We have some BIG news about the Children’s Home that we will be sharing at the event! You don’t want to miss it! So before I leave on a trip a lot of people will ask – what’s the temperature down there right now? Back in the winter it was a perfect 85-90 every day-perfect! But this past week when we were down ..not so much ! It was 95 or hotter every day with the humidity feeling like you couldn’t breathe! Hence why we don’t normally go to Haiti this time of year! But the funny thing is, the whole team barely noticed it! Yes we sometimes pulled our fans out to cool off and we went out for cold drinks more than once but honestly I did not hear a single complaint! That really put my attitude into check while we were down and I was thankful for such an awesome team! It was a small team but we had so much fun together, got a lot done, and had the time to spend quality time with the Haitians. Which in my opinion is the most important thing we did while we were down! Because if we don’t take the chance to make friends with the people we say we are trying to help, we’re never going to make a difference in the community. But this team did and I really appreciated that. As I said we got A LOT done on the trip! We were able to hold bible school for the kids with stories like Peter walking on the water… We had the kids paint their feet and walk across paper to imitate as if they were to do it. They got such a kick out of it. We also did the story of Samson and Jesus calling together his disciples. One day during the week we shared with the kids how to find salvation and several of them made the decision to follow Christ! It was so special to share that moment with them! We fed over 150 kids on the last day of bible school and it was awesome to know each of them were going home with a full belly that night. Sometimes you look at them and you can literally see the hunger in their eyes. It breaks your heart in two. It always makes me giggle when I see them running out the doors after they’re finished. They are always crazy and giddy and simply acting like kids should after they have that full meal. It’s a reminder for me to pray for the days where there is nothing to eat and for strength in those times. We also took time to paint the depot at the Children’s Home. It was several hours of work but we had a great group of Haitians and Americans working along side each other, and we got the job done quickly! I love it when you see the teams work right with the Haitians and learning the way they do things as well as taking the time to talk with them, even if it is mostly hand gestures and head nods! I know how much they appreciate it and I really do too. Thank you again to an awesome team! One day we visited the prison in Mirebalias. There were almost 400 prisoners in 13 cells. We were able to take them a treat of juice and bread along with personal hygiene supplies such as soap, shampoo, toothbrushes and toothpaste. Thank you all for your generous donations for the prisoners. We were told that 2 of the prisoners, that have been released, accepted Jesus as their Savior in prison. Since their release they have moved back into the community and continue to lead churches. God is on the move. – written by Cindy Z. Our next team will leave in 3 weeks to work on our Child Sponsorship program. They were hand out shoes and school supplies to the children in our program as well as pay tuition to the schools where the children attend. Please pray for them as they serve. THANK YOU! 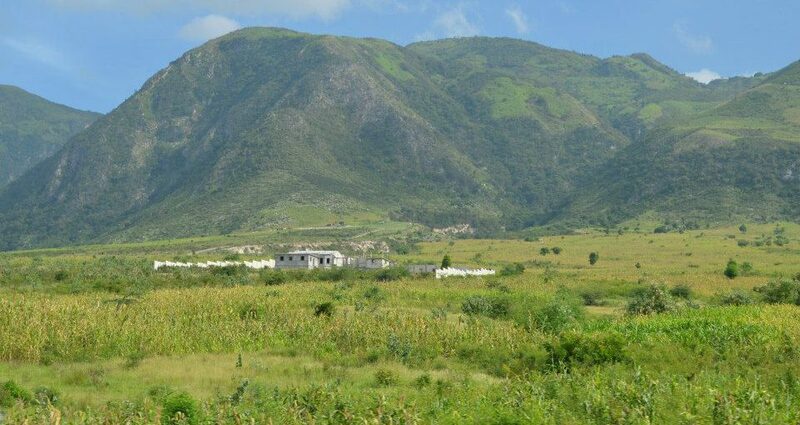 for your prayers, support, and love – we feel it and are so excited for the work God is doing in Charrier, Haiti. PS – Also just a reminder that our big fundraiser for the children’s Home is coming up! There will be a gooood Lancaster county chicken meal, raffle prizes, and line dancing – you surely don’t want to miss it! Click the HoedownforHaiti_2016 link under the picture to download the invite and purchase your tickets! Hope to see you there!! Hoedown for Haiti 2016 – Save the date! Hey guys it’s getting to be that time again! The 2nd annual Hoedown for Haiti will be October 15th! All proceeds will go toward New Life Mission – Haiti, Inc.Children’s Home!! We’ll be having J.R.’s Brisket & BBQ ‘s chicken again this year as well as line dancing with DJ Boots & Nancy ! This year’s funds raised will go towards completing the final details of the home (plumbing, electric, doors, windows, flooring) as well as a multi purpose pavilion where we can serve meals, play with the kids, etc! Thank you so much for your support and we hope to see you at this year’s Hoedown for Haiti 2016! Ticket sales will start August 1st!! With Love, from the Estime’s! Bonswa ( good evening ) from Haiti! I hope all is well for you and your families! These past two weeks we had two awesome teams join us in Charrier. The first week was a medical clinic. The most common symptoms of the people here are dry eyes & coughing from dust, acid reflux, fevers and/or malaria like symptoms, high blood pressure, among other things…We were very blessed with more medication then was ever received for a medical team in the past. More than 650 people were seen in the four days of clinic and Mama Ruth was able to pray with each person or family that came through. I want to say a special thank you to each one of the team members last week (Cindy, Ruth, Dr. Quimby, Brady, JC, Olivia, Kelsey, Jesslyn, Lucy, Melissa) and all of our translators who put in long hours so we could treat as many people as possible. Many people in our zone do not have enough money to see a doctor just for the common cold let alone have money for the taptap to get there so our clinic is their chance. We praise you Jesus for the ability to reach out to the community in this way! This week we had the pleasure of hosting a team of close friends! They directed a Bible School for 3 days for the children. The bible stories included: Daniel and the Lions den, Jesus and the paralyzed man, and the Good Samaritan. Every night they did a craft with the kids which they just love, see pictures below! This week’s team had a little more downtime then we’re used to but it gave them the opportunity to spend quality time with the children & family and learn more about Haitian culture – including helping us hand wash our laundry ! Yesterday we were able to go to the prison and serve the 375 prisoners juice and bread as well as sing hymns and pray with them. We understand these are troubled men and women, but we hope with our visit it plants that seed that will one day blossom into a relationship with Christ. Please join us in prayer for them that they will repent of their sins and come to know the Lord. Again I would like to thank each one of this weeks team members ( Cindy, Ruth, Jodi, Ryan, Rachel, Jill, Lauren) – it was such a pleasure to have you here with us – Especially Rachel, 14 & Lauren, 12 who are the coolest teenagers I know and made this past week such a blast! Both teams were able to feed the kids big plate of rice & beans with sauce and chicken – serving nearly 150 kids each week. Knowing all the kids are going home with a full bellies brings so much joy to my heart and I know to the team members as well. My good friend Jill Zimmerman came down this past week and relayed the news to me that her church’s children (Also my former church – Alive Church Ephrata) had raised money for the children’s home. They had done this last year and raised a crazy awesome amount of over $4,000! This year Jill decided to ask our American director, Cindy Zimmerman for an idea of a specific need we had right now and she gave them the idea to raise money to buy a stove for the home which was estimated at $5,000. I was estastic and speechless when Jill told me the news that they not only surpassed the fundraising goal, but raised enough that we can purchase the next model up and get a double oven! God is so good people! It’s been so crazy to me to see how God has used so many children to help us raise funds for the home. From birthday money to lemonade stands to numerous vacation bible schools and more! Children from Hinkletown Mennonite School also donated supplies for the children’s home and sent them along with Rachel this week who is a student there! It touches my heart to know that maybe we are not only finding ways to bless children in Haiti but also helping our children in the states to grow in their faith & relationship with Christ as well! Thank you so much Jill and everyone at Alive Church Ephrata for your support of our mission! Rachel delivering the supplies for the home donated by Hinkletown Mennonite students! Lauren loving on the kids! If you haven’t looked at the pictures of the children’s home yet – do it right now! The roof is up and the construction is complete! My eyes water every time I think about it! In the short 3 + months we’ve been here the 6 bedroom, 3 bathroom house was constructed almost completely by hand. From the beginning Zacharie’s goal of this trip was to finish construction with the roof complete… but not only is that done but the walls are being smoothed, steps are being constructed, doors and windows are going in, and the outdoor kitchen roof is about the be poured! I cannot believe my eyes every day that I stare at the job site and it continually reminds me that God is behind us and only by his hands is this possible! I also want to give a special shout out to my hubby Zacharie for all his hard work and dedication to the children’s home – your dream is coming alive and I am just so happy for you! And we are so thankful for the support of prayers and finances for this project from all our family, friends and even strangers! We just cannot wait to open the doors to the children! The roof of the kitchen will be poured within the next week! The children’s home roof being poured! So now we have less than 2 weeks till we come home. I am extremely excited to see my family but am so torn because I am not ready to leave our family and friends here either! Time has flown! I have been struggling with our inability to stay as I just want to continue to move forward with the Children’s Home but I know that this is God’s timeline and not mine. We waited nearly 4 years before we began construction of the home and I know that was God preparing us to get to this point – Just as he will prepare us the next couple of months to open next year! Please pray for us as we are about to transition back to the US and that we do not get caught up in the busyness of our stateside life! We are so blessed as both of us are returning to our previous jobs when we get home! You all know how rare that is and we are just so grateful to God and our bosses back home. Thank you everyone for your prayers and words of encouragement while we have been away! We love you all so much and are excited to see you soon! Please pray for safe travels for us along with Melissa who will be traveling home with us! God is so, so good and we can’t wait to see what the next step will be for New Life Mission and New Life Children’s Home! Another Update from the Estime’s! Hello from Kaliko Beach Resort! We took a much needed day of rest today as a family along with Melissa and a friend of ours. We have been working 6 days a week, sometimes 10+ hour days to make as much progress as we can before we leave in 6 weeks! Time is really flying! Currently the workers are preparing to put the roof on the home by laying plywood and tying wire for the steel forms. Zacharie anticipates being able to lay the concrete in the less than 2 weeks. As you can imagine this will be a BIG project and a LONG day of work needing many hands to finish. The home has 6 bedrooms and 3 bathrooms so it will be a sight to see as they will work rapidly to finish the roof in one day. The foundation of the kitchen is almost finished and Zacharie hopes to have that completed before we leave as well. After the walls go up for the kitchen they will begin to smooth the interior and exterior walls of both buildings and possibly begin putting in doors and windows. Time will tell but it has been absolutely amazing to watch the progress over the last 10 weeks! English School has been going very well! There was probably over 100 people in each class on the first day and even more on the second day! Melissa started by teaching them common greetings and has covered a lot in the last three weeks – Numbers, family members, time, the body, clothing, and more! We are so amazed at what the students are able to retain after just one day of learning each subject. Now the class sizes vary and we have roughly 30-50 kids and 40-60 adults every evening, Monday – Thursday. Many of the kids go to school in the morning and yet still come to class each evening while the adults work long days at the children’s home, in their gardens, or at market, etc and still never miss a class. It’s amazing to see as this willingness & eagerness to attend class is not very common for people in the states! We’re so proud of Melissa as she does not use a translator and with the creole she knows is able to teach without difficulty! It’s awesome! Lately we have been feeling fatigued from the constant asking from people in the community. I personally get so angry sometimes and want to yell, “Do you think money grows on trees? !” Mostly people ask for just basic needs like a toothbrush or soap, and children for a toy car or even just my half drunken water bottle in my hand. Of course I want to give them everything as it’s easy to see how much everyone is in need but sometimes when you hear the words “give me” 100 times a day it’s hard to remain light hearted and humble. However today when we came to Kaliko, God opened my eyes to how richly I have been blessed in my life and how much I have. I have a bathing suit and sunglasses, which most Haitians that I know do not. I have two towels for everyone in my family and most Haitian families share one. I have a laptop, an Iphone, a car… the list goes on and on. I have so much and these people have so little. I need to remember that God has placed me here so that I can be a resource and hopefully bless the community as they have blessed me in too many ways to count. Many of my family and friends here would give me the shirt off their back if I asked for it. It brings me to tears when I think about all the things they have done for me. We have been paying a sweet friend named Vedna to do our laundry for our family and Melissa once a week. She is 23 years old and has a 5 year old son. This past week she told me she did not want paid, that it was a gift for us. I wanted to stuff the money in her pocket and not let her refuse but God told me no, let her bless us in this way. I was just so touched. What was even more awesome was the next day when we went past her house, there was a line of clothes & linens hanging on a line. She has started a little business by buying items in market and reselling to the community. God works in so many more ways than we are even aware of. I need to remember that yes people may ask a lot but they are in need. Though Vedna did not ask for the job, it was a still a way that God used something we gave to richly bless someone. So I want to remember that if we choose to listen to when God tells us to give, we will be blessed in return. There are 2 teams coming in April! The first is a medical team and we will have 4 days of clinic in Charrier. This will be awesome for the community as we haven’t had clinic in almost 2 years! It’s always crazy as hundreds of people come for all different sorts of reasons, so please pray that everything goes smoothly! The second team is coming to do a VBS for the kids which is always a blast! My good friend Jill Zimmerman is coming with her daughter, Lauren and I am just so excited to share Haiti with them! Please pray that traveling goes well for both teams and they may experience God in a new way during their time here! Thank You so much for your prayers for our family! As I’ve said before, we feel God moving in Charrier and we are so happy to be able to be here and serve! Will try to send another update before we leave! Blessings! January and February we hosted six different mission teams. Thank you all for your hard work as you came and worked sided by side with our Haitian friends to begin construction on the Children’s Home. It was extremely hard work. Each step in the construction process was done by hand, from digging the foundation, to mixing cement, to filling in the foundation with gravel, mixing cement on the ground, carrying cement and water in five gallons buckets, we were all hot, tired and sore, but in a good way, as we were able to connect with our brothers and sisters in Christ as we worked together. New friendships were made and old ones were built even stronger. God is awesome as he provided the energy we needed to continue to move forward. When we began January 11’th, it was just bare land. Now the walls are up on both the Children’s Home and the second floor on top of the depo. The septic system is being dug. That hole is immense, 20 feet deep, all by hand. It was amazing. The electrician and plumber are at work running the electrical wires and installing the bathrooms. The tile is laid in the sleeping rooms and bathroom above the depo and The Estime’s will be ready to move in there possibly by next week. The roof was poured on the depo and before you know it the roof will be poured on the Children’s Home. The kitchen is beginning to be constructed. This has been an amazing and exciting project. All our hopes and dreams coming true. We serve an awesome God and give Him all the credit, honor and glory. Again thank you all for coming to visit Haiti. By bringing all your gifts and talents together you made this a possiblity. I am forever grateful.